Our friend Hareesh came to India in September for his lectures and initially there was no plan to come over to Delhi. We also didn’t have a plan of visiting Chennai or Coimbatore so we thought we would miss meeting each other in this visit. Then his schedule changed a bit and he was able to come over for a couple of days. As soon as he entered the house, on Sept 23rd, after saying hello to Amma, his first statement was – I have come just to eat all the different local specialities and nothing else ! 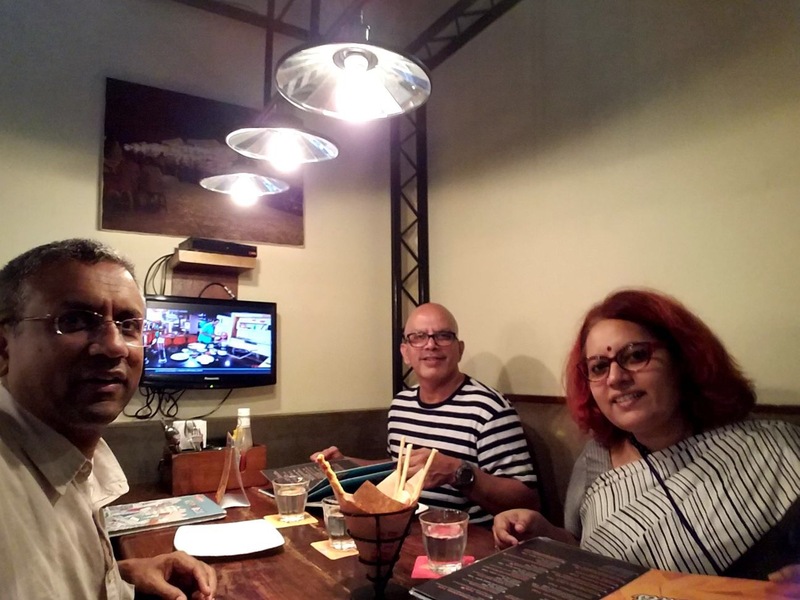 The last time Hareesh, his son Ashwin and his niece Shruti had come over, we had taken them to Agra and on the way we had eaten at Ram Babu paranthe wale. And I am still told about how those paranthas were the best in the world :):). This time around we decided to take Hareesh to a few of the special street food joints in Delhi NCR. The day he came over, we went to Cafe Delhi Heights for dinner. The food was outstanding as expected. Infact Hareesh was bowled over by the bread that they bring in before serving food. In the picture below we are just beginning to order food. 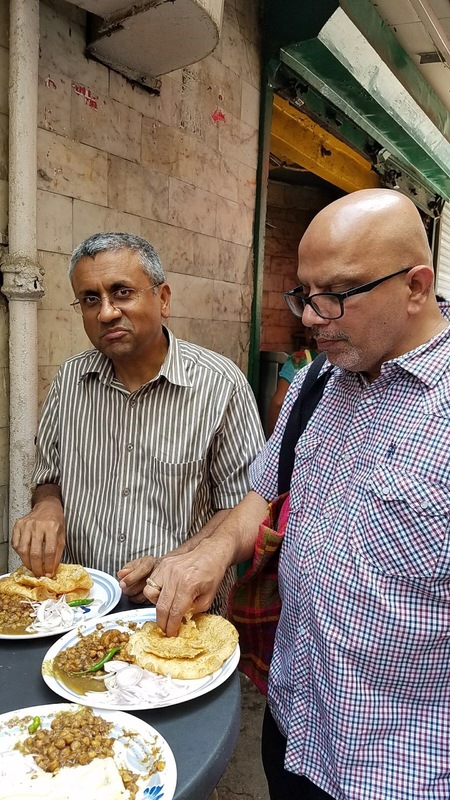 The next day, Sept 24th, we decided to go to the famous “paranthe wali gali” in Chandni Chowk, so that Hareesh would have something to compare with the Ram Babu paranthe wale memories. Since it was a Sunday, we took the metro from Gurgaon to Chandni Chowk. Hareesh loved the metro ride. We walked across to the paranthe wali gali and went to the first restaurant, as always. This was established in 1875, so more than 140 years old. They fry the paranthas and more than the paranthas am a huge fan of their side dishes, the subzi, the sweet chutney etc. We had different paranthas and then Hareesh shared a lassi with Krishnan. After purchasing our dry fruits, we took a shared battery operated auto and came near the Red Fort entrance to catch an Uber taxi home. In the taxi we ate the Nan Khatai which was really good and still warm. In the evening, we went to Galleria and Hareesh got his Keventers fix. Ashwin , you were very much on our minds as I took this picture and I shared your comment with your father that Keventers must replace the baby formula :):). On Monday, Sept 25th, we went to Kamla Nagar to eat Chole Bhature at Chache di Hatti and now, I have discovered the best Chole Bhature in the whole wide world !! 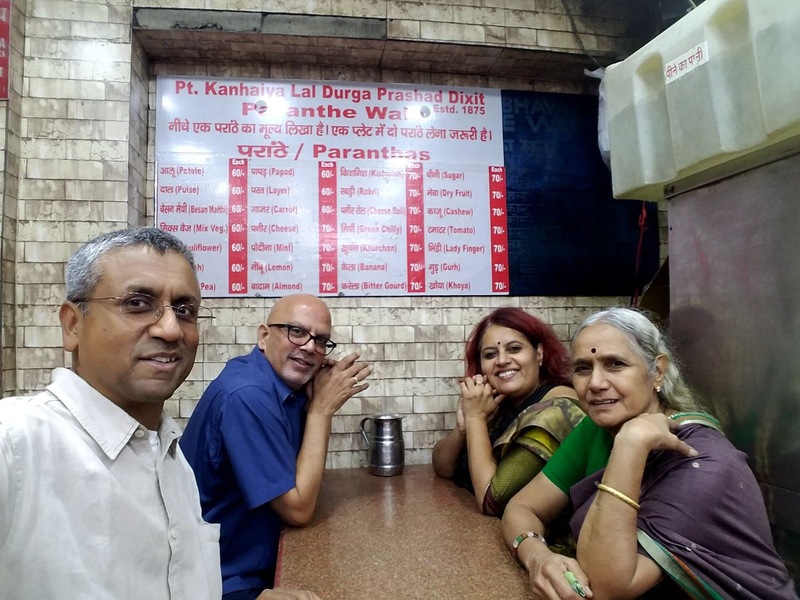 Krishnan and I were in Kamla Nagar after nearly fifteen years and it was still the same, except for the metro station etc. I am not a big fan of Chole Bhature but I have become a fan of Chache di Hatti’s Chole Bhature/Kulche. Am sure he puts some secret ingredient in there :). 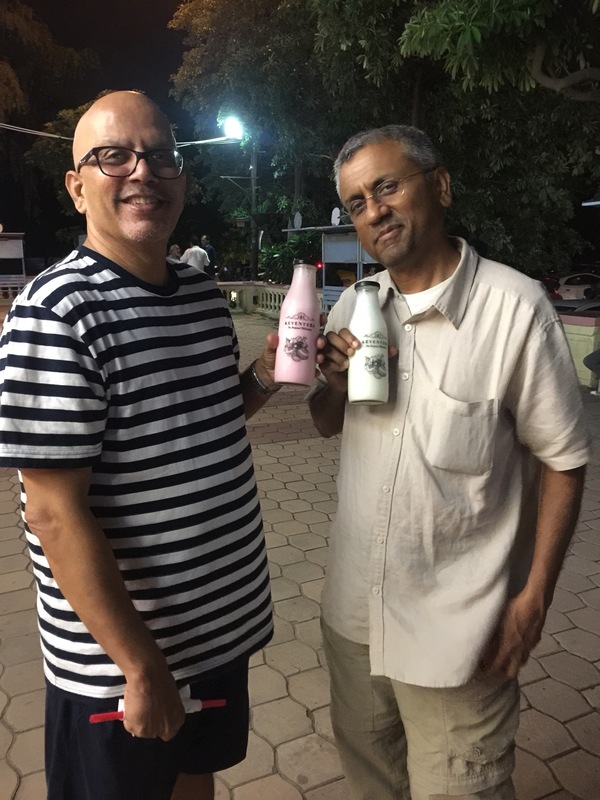 After eating our fill and buying some for Amma we walked towards our Bhelpuri shop … Krishnan and I were trying to locate the store purely with our memory. 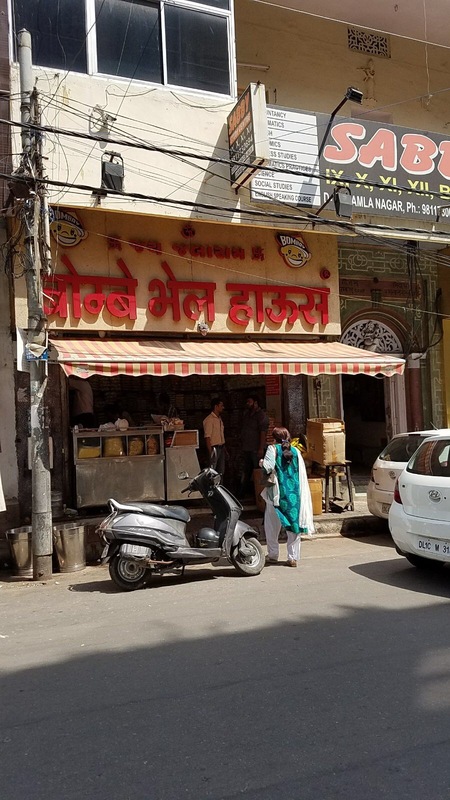 Varun had introduced this shop to me and Krishnan had bought the Bhelpuri from here many times as he had work in this area often during the time that we lived in Patparganj. We both didn’t remember the name of the shop. Finally after several turns, we found the “Bombay Bhel House”. Since it was Navratras, we got the Bhel without onions but it was still outstanding as always. We packed a few plates to eat at home and I bought all the dry stuff needed to make the Bhelpuri at home. It was quite warm by this time so we caught a taxi back home. The taxi’s air conditioner stopped working near Chhattarpur … and we reached home a little sweaty. But, we forgot all about the sweat and discomfort the minute I mixed the Bhelpuri at home and opened the Chole Bhature to have another go at it with Amma. Krishnan took Hareesh to Delhicacy, a really good restaurant in Galleria to have some “chaat” and he was very happy with the taste. What an awesome food trail in two days and still we missed a few staples. Now that winters are around the corner, we can do another food trail….. The roller ice cream, Natraj’s Dahi Bhalle, Lajpat Nagar’s Momo’s, Aloo tikkis, Samosas, Kamla Nagar’s bread Pakodas… hmmm, my mouth is watering ! Categories: Food & Health, Live to travel, Other Loves !! Sickened to the stomach …. Let me know when Anu. Wow, its a small world indeed. Hi to Vivek and you don’t look like a mom-in-law :).